If you’re looking to take a road trip in the USA, perhaps the most iconic of all is Route 66. Spanning over 2,400 miles from Chicago to Los Angeles, this driving route will take you through a broad span of America, from big cities through to vast desert landscapes. 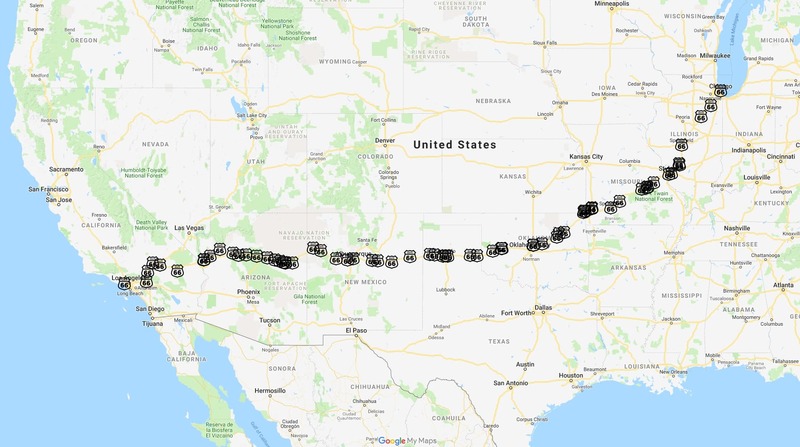 We’ve driven the entirety of Route 66, and we’ve already put together a detailed guide to planning a Route 66 trip, as well as a two week Route 66 itinerary. However, we know that not everyone necessarily has as much time to take two or three weeks driving Route 66, and we wanted to put together a shorter Route 66 road trip itinerary for you. The itinerary that we have put together for this post is for 8 days and 7 nights, from Chicago to LA (or the other way round). This is one way. Before we launch into this classic USA road trip itinerary, we just want to clarify a few things about driving Route 66 in a shorter amount of time. To do the route in this amount of time will require spending some time on the interstate rather than following the original route faithfully. Specifically, you will spend a fair amount of time on I-40, which was the road that replaced the original Route 66 for the stretch from Oklahoma City to Los Angeles. In many places, the I-40 runs right next to the original route, or even over the top of it, so the overall experience is not too dissimilar – it will just be faster and a little less authentic. If you want to absolutely faithfully follow the original Route 66 route you will want to spend a bit more time. It would be very challenging to follow the original route in a compressed time frame as the speed limits are slower, and it passes through a lot of smaller towns which will also slow you down. 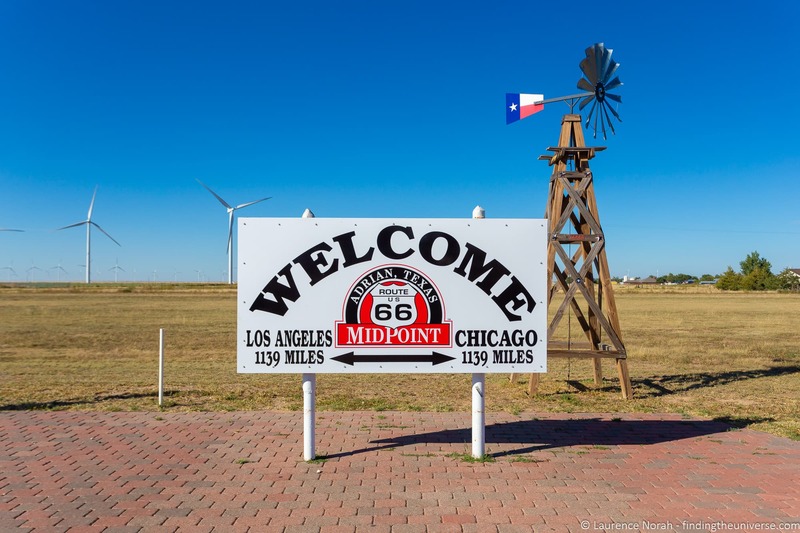 If you want to follow Route 66 as accurately as is possible today, then we’d suggest you need a minimum of two weeks for that trip, and you should check out our two week Route 66 itinerary. Of course, it is also possible to drive the route in a shorter amount of time by spending even more time on the interstate and less time on old Route itself. We think this negates the point somewhat (and we’re not sure at what point it stops being a true Route 66 road trip), but we also appreciate not everyone has huge amounts of time! The total drive time from Chicago to LA on the interstate is 30 hours. If you mostly stuck to the interstate, and just did a few sections of Route 66, you could get from Chicago to LA in three to five days if you really rushed it. However, we’d really recommend trying to find more time, and taking at least 8 days to do the route, as we have laid out here. If you have the luxury of more time, then you can follow our two week itinerary, which can also be done at a more leisurely pace of three week or more! That’s enough preparation. 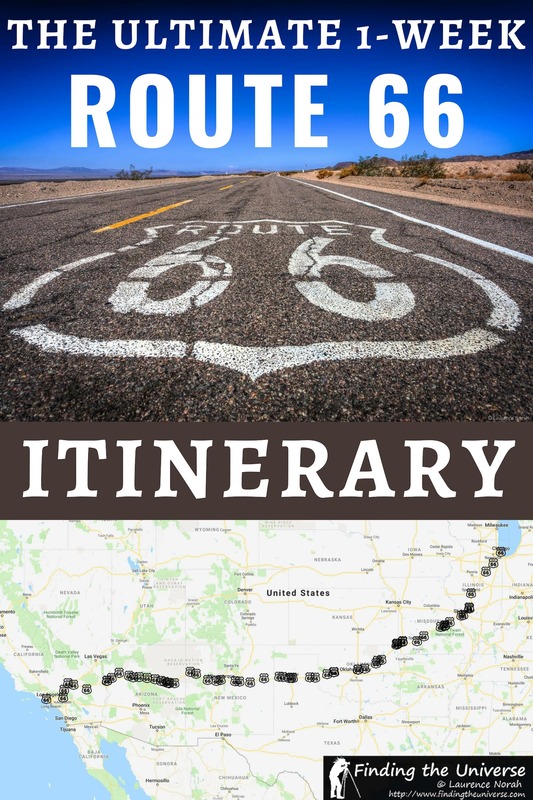 Let’s take a look at our one week itinerary for what might be the most famous road trip in the USA, and probably even the world – Route 66! Route 66 officially starts in Chicago. As with many roads, Route 66 changed over the years, and there are a number of different versions of the road, which are referred to as alignments. Chicago is no different, and there are in fact two official starting locations. The first dates from 1926, and is on Jackson Boulevard at Michigan Avenue. The second is from Jackson Boulevard on Lake Shore Drive, and dates from 1933. To be honest, the locations are pretty close to each other, and other than a small sign that you might miss if you weren’t looking for it, aren’t that exciting. So instead we suggest you just start rolling – you’ve got over 2,000 miles to drive! 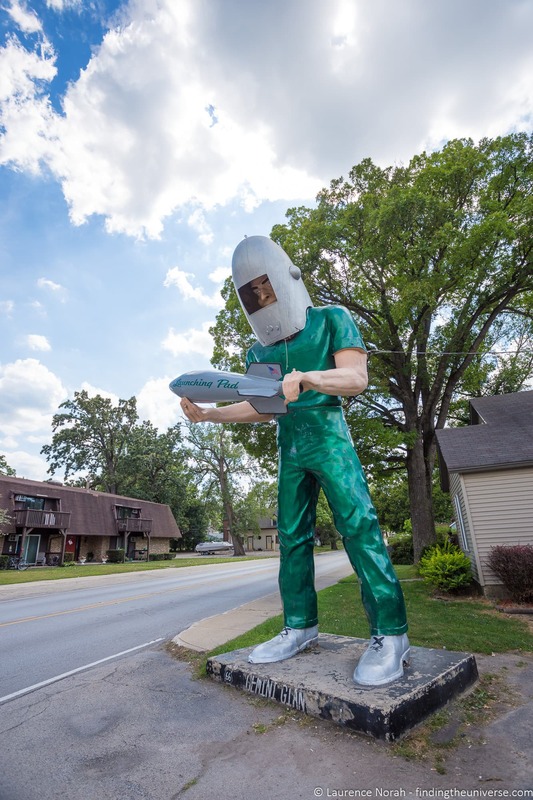 Our first highlight on the route that you’ll want to stop for a photo of is the Gemini Giant in Wilmington, IL. Route 66 was home to a whole range of quirky, oddball attractions, and you’ll be seeing a lot more of these as you go. The Gemini Giant is one of the original Muffler Men. 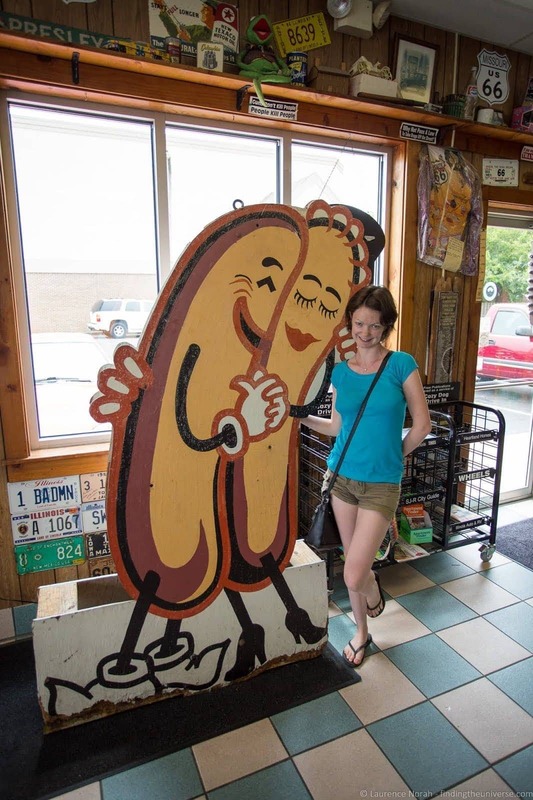 These were large statues of men created in the 1960’s as advertising props – often the man, who who be around 20 feet tall, would be depicted holding whatever the store in question was advertising. These ranged from hotdogs to car mufflers. The Gemini Giant is outfitted as a giant astronaut holding a rocket, and was used to advertise the “Launching Pad” restaurant. It can still be seen today outside the restaurant (currently closed), and is a great first start for your Route 66 quirky objects collection. Further on from Wilmington you’ll come to Pontiac, where a stop at the Route 66 Half of Fame and Museum is a must. Most states on the route have their own Route 66 museum (we stopped at all of them! ), and we highly recommend stopping at at least one or two of them. We think this first one is a logical start to get yourself acquainted with the Route, and the journey you have ahead of you. From Pontiac, head on to Springfield IL, where you’ll have the option for the first classic Route 66 food stop. As you would imagine, a road trip like Route 66 inspired a whole host of dining options, many of which have been going strong for decades. The first dish we suggest you try are the Cozy Dogs (their name for a corn dog) at the Cozy Dog Drive-In in Springfield. This has been a Route 66 staple since 1949, with the same family running it throughout. If you’re not from the US you might not be familiar with what a corn dog is – it’s essentially a hot dog sausage covered in cornmeal batter and then deep fried. A word of warning about Route 66 – the meals along the route tend to be of the fast food variety, so if you want to try the classics, don’t expect to be doing a great deal of healthy eating! From Springfield, continue on until you reach Staunton, where we suggest you visit Henry’s Rabbit Ranch. 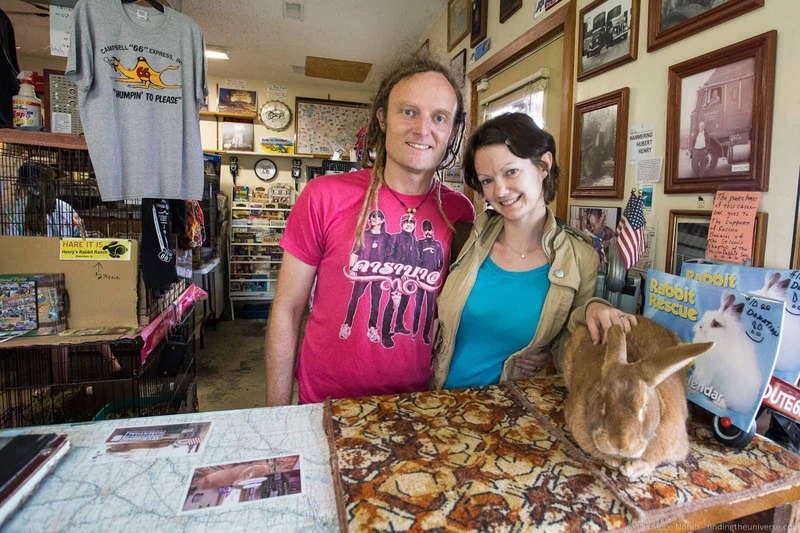 This is the home of Rich Henry, who has created a unique Route 66 attraction which is home to a variety of lovely live rabbits that you can meet, a number of old VW vehicles, as well as other Route 66 memorabilia. We definitely recommend stopping in here and picking up a souvenir or buying a soft drink to support this Route 66 location. If you still have time on your first day, you might also want to visit the Pink Elephant Antiques Mall in Livingstone, before ending your first day’s journey in St. Louis. Here you’ll find a range of Route 66 era signs and statues, which include a UFO and a giant pink Elephant. Finally, you’ll finish the first day of your Route 66 adventure in the city of St. Louis. St. Louis is a major city with a number of attractions – the most famous of which is the Gateway Arch. This is a 630 ft high monument which is also the tallest arch in the world. Complete in 1963, the Arch would have been seen by Route 66 drivers towards the end of the Route’s heyday. The Arch is a fitting Route 66 symbol, as it is a monument to the westward expansion of United States – an expansion in which Route 66 played a major role for half a century. Today, the Gateway Arch is a National Park. You can ride to the top in a tram for wonderful views across the city. Our last Route 66 stop for the day is another food highlight – Ted Drewes Frozen Custard. As the name suggests, this seasonal attraction serves up frozen custard, which is a bit like ice cream. They are also famous for their “concretes”, which are malts or shakes which are so thick they are served upside down! Ted Drewes Frozen Custard have been serving Route 66 travellers since 1930. There are a number of locations, but the Chippewa Street location is on Route 66. With that, you are done with your first day on Route 66! Time to relax for the evening before continuing with your next day. We have a few recommended locations for you to spend the night. St. Louis is a large city with a great many accommodation options. 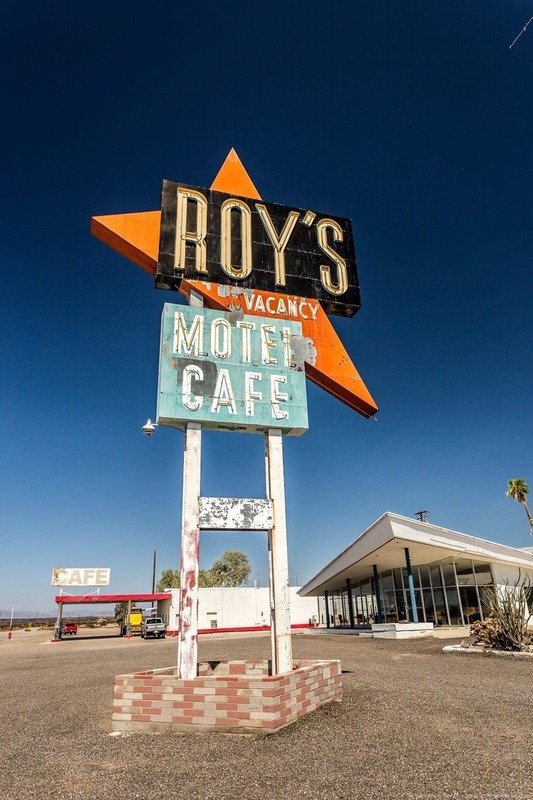 There aren’t any of the classic Route 66 motels that you’ll find in some of the stops further along the route, but there are a few locations we can recommend. The Holiday Inn St Louis SW Route 66 – This is a well-reviewed chain hotel that includes a free continental breakfast and has a Route 66 theme. This would be our main pick for a Route 66 hotel in St. Louis. The Drury Plaza Hotel St. Louis at the Arch – This 3-star hotel includes a terrace with a view of the Gateway Arch and stays include breakfast. Four Seasons – If you are looking for 5-star luxury option in St. Louis, we suggest that the Four Seasons is your best option. 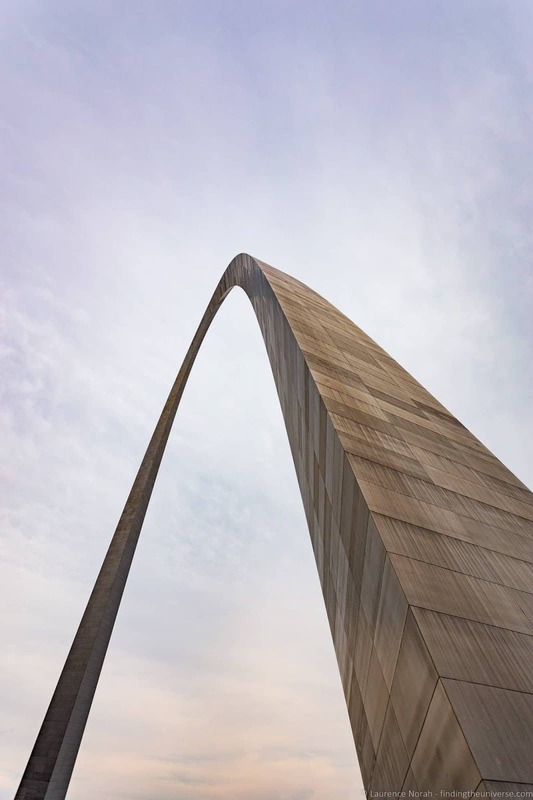 Hampton Inn St. Louis at the Arch – This is a great option for a good-value hotel which is within walking distance of many of the city’s top attractions. You can see the Gateway Arch from the hotel and breakfast is included. If you are looking for a lower budget option we can also suggest taking a look at Airbnb as you can find some good deals on rooms and apartments even in the downtown area. 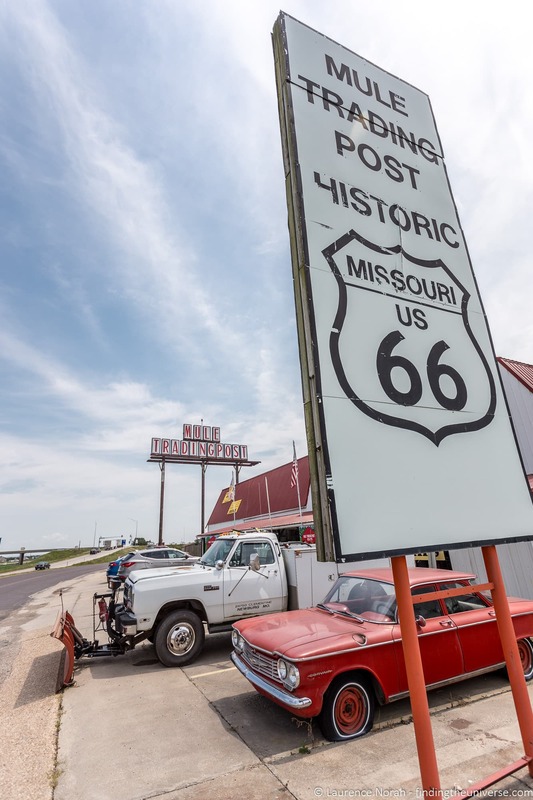 The second day of your Route 66 adventure across the USA is going to take you right across Missouri from St. Louis to Carthage. There are a lot of attractions along the way, and it’s going to be a minimum of four hours drive, so we’d suggest picking a few of the following for your day. 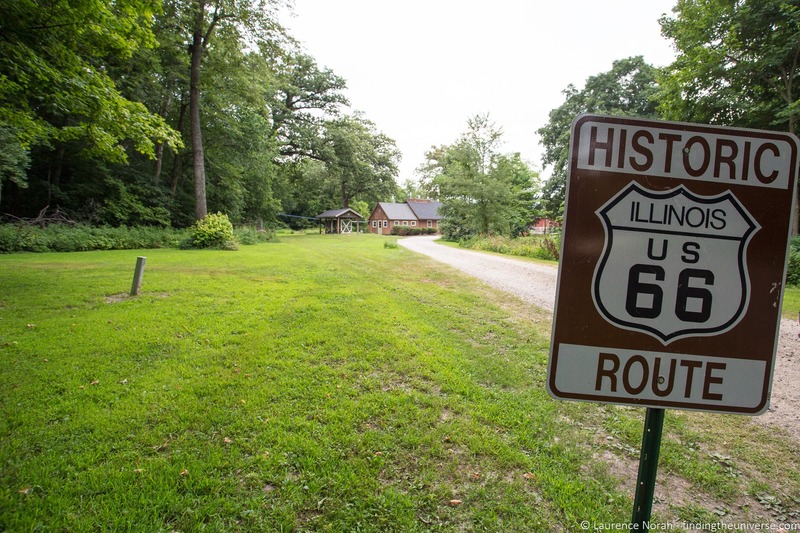 One of the most famous stops on this part of Route 66, and the first one we recommend you stop at yourself, is Meramec Caverns. This is a 400 million year old 4.6 mile long cavern system near the towns of Sullivan and Stanton. 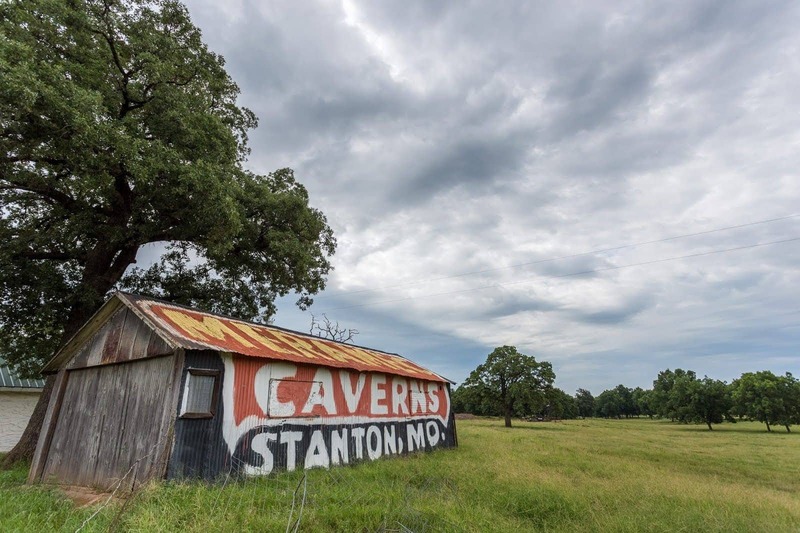 Meramec Caverns has long been a Route 66 attraction, and it was made particularly famous by the advertising that was painted all over barns and other buildings along the Route advertising it. A few of these original advertisements can still be seen, and they are now Route 66 attractions in their own right. The cave can be visited by guided tour, and it’s still one of the most popular attractions in the state. Tours run throughout the day, departing every 20-30 minutes, and last for approximately eighty minutes. Whilst you could get a coffee at Meramec Caverns, we would instead suggest you continue on the route until you get to Cuba. This is home to a number of Route 66 attractions, including the Wagon Wheel motel, which is the oldest continuously operating motel on the Route. They have coffee and soda available in their gift shop. Other attractions in Cuba include a series of lovely murals, a restored 1932 Phillips 66 gas station and an operating drive-in theatre. A little further along the route and you will come to Fanning, home to a giant rocking chair, which is worth a photo stop. The Rocking Chair is outside the Fanning 66 outpost, where you can pick up Route 66 memorabilia and souvenirs. The next stop on your second day on Route 66 is the town of Rolla. Here you’ll find a variety of attractions, including the Mule Trading Post, which has been in business on the Route since 1957. Other highlights of Rolla include a scale model of Stonehenge and the Totem Pole Trading Post. From Rolla there are a number of towns and Route 66-era attractions, from the 1923 bridge at Devil’s Elbow to the Munger Moss Motel at Lebanon. Time will likely be against you by this point however, so we’d suggest pressing on, with just a quick stop at those attractions you are interested in. If you want to, a stop at the Route 66 Welcome Centre near Conway makes for a good break point, it has maps, information and exhibits about the Route, as well as restrooms and its own neon sign. Otherwise, head on for Springfield. Springfield is a fairly large city, and multiple alignments of Route 66 ran through the town over the years. As you would imagine therefore, there are numerous locations where you will find Route 66 attractions, including the Route 66 Car Museum. There are also old gas stations, neon signs, and a number of old Route 66 motels. Finally, head on to Carthage, where we suggest you spend your second night on Route 66. Boots Court – Lovingly restored to its 1940’s glory, this motor court would make a fantastic and authentic stopping point for your second night on Route 66. The motel is an Art Deco-Steamline Modern motel, and celebrities including Clark Gable have stayed here. We highly recommend this location, but you’ll want to book well in advance as there are only a handful of rooms. Best Budget Inn – This is a great budget option with good reviews. It’s no frills, and dates from 1955, although restoration work has taken place to bring it up to date. Quality Inn & Suites – Another great budget option with an indoor pool, fitness center, and included breakfast. 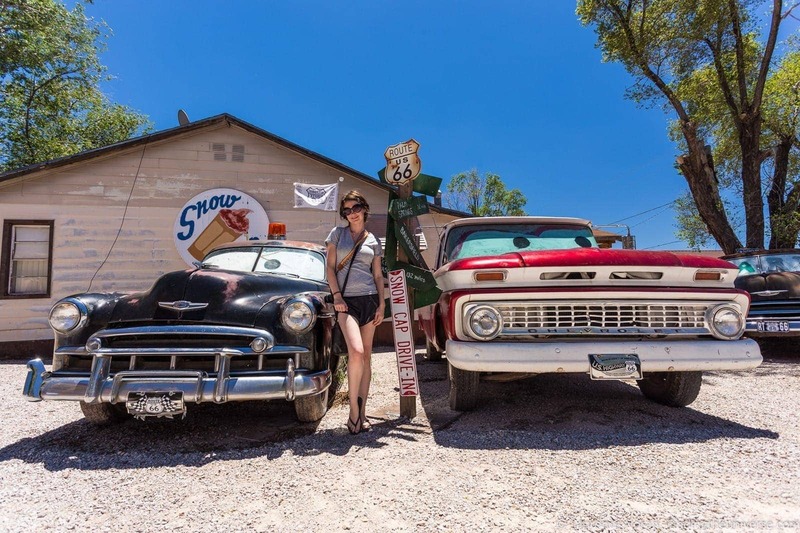 We suggest you start the third day of your Route 66 itinerary by visiting Red Oak 2. This is about a four mile backtrack, so if you have time on Day 2 you could also fit it in then. Red Oak 2 is partly an art installation and partly a community where you will find a variety of old buildings from the surrounding area which have been relocated and restored. You are free to explore and look around here at the various building and art installations, but please do be respectful as people live and work here. From Red Oak 2, head on to the town of Galena. On the way, you will pass through Joplin, which has a number of Route 66 era motels, signs, and stores. 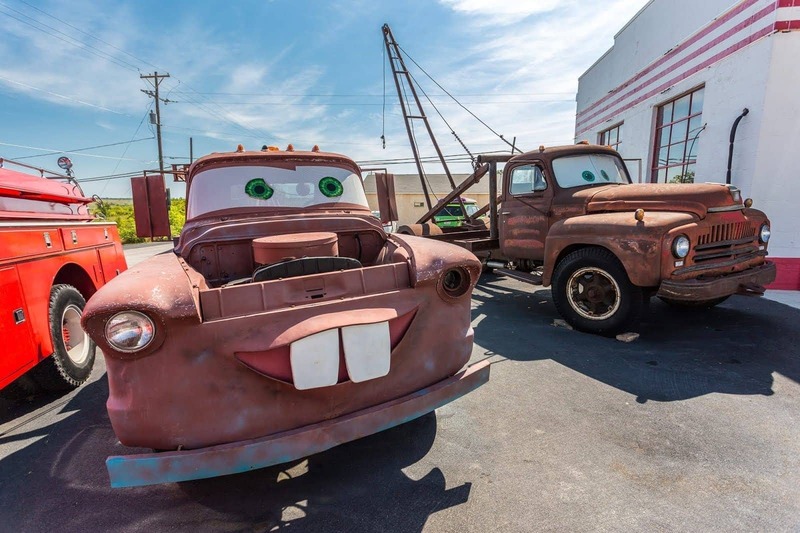 The main attraction in Galena is the “Cars on the Route” gas station, a restored gas and service station which is home to the tow-truck which served as the inspiration for the character “Mater” in the Pixar Cars movies. Note, the movies draw inspiration from many parts of the route, and there are many claims to connections, but the tow truck has been confirmed! Galena is also your first stop in Kansas. Kansas only has 13 miles of Route 66, making this the shortest stretch of Route 66 in any of the eight states that the original Route passed through. The major town that the route passes through in Kansas is Baxter Springs, where you’ll find a Route 66 visitor centre. This is in a restored Phillips 66 station and is worth stopping at. Kansas is also home to Riverton General Store, which dates from 1925, and which is a good place to stop for a snack or drink. From Baxter Springs we suggest rejoining Interstate 44 where you’ll head down into your fourth state of the Route – Oklahoma! 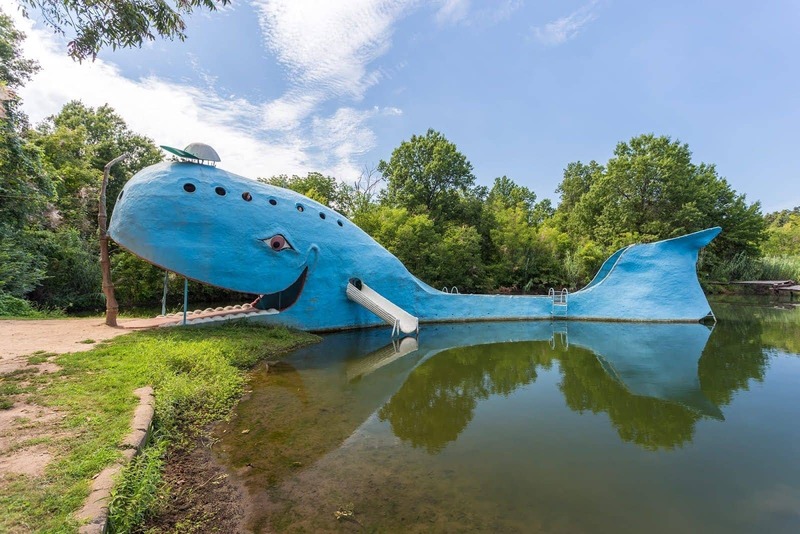 There are a number of great stops in Oklahoma, but as we don’t have an infinite amount of time, we suggest you head straight down to the Giant Blue Whale in Catoosa. This is one of the more recognisable and photographed stops in Oklahoma, and consists of a large blue whale which was once part of a larger attraction. Now it’s largely used as a swimming area and photo stop. From Catoosa you’ll head into Tulsa, where there are a number of attractions and photo stops, including Cyrus Avery Centennial Plaza. This has a number of Route 66 related installations, including flags of all the Route 66 states and various bronze statues including a car driven by Will Rogers. If you are hungry, Tulsa is home to a variety of eateries, including Hank’s Hamburgers, which has been serving burgers and malts since 1949. Another favourite is Ike’s Chili, which has been in existence since 1908! If you want to photograph some murals, head on to Sapulpa, about 20 minutes from Tulsa, where you’ll find a number of old murals, some of which date from Route 66 times. The Sapulpa Historical Museum is also excellent. From Sapulpa, continue on to Chandler. Chandler is home to a variety of attractions, including the Route 66 Interpretative Centre and the Lincoln County Museum of Pioneer History. However, our suggestion is to make a beeline for McJerry’s Route 66 Gallery. This is owned and run by Jerry McClanahan, a local artist and lover of Route 66, who is also the author of the fantastic EZ 66 Guide. This is without doubt the best and most accurate printed guide for travellers looking to follow Route 66 as faithfully as possible, and is the book we used on our Route 66 journey. If Jerry is in, you can meet him, peruse and buy some of his artworks, and talk about all things Route 66 related. We loved meeting Jerry when we drove the Route, and the artwork we bought from him is a lovely memento of our trip. He also kindly signed our EZ66 Guide! Next, head on to the town of Arcadia. Here you’ll find the Round Barn, an unusual farming structure which dates from 1898, as well as the POPS soda store. This is a newer Route 66 attraction which has a huge soda bottle outside the front, and all kinds of soda for sale inside. You can also eat here. Finally, head on to Clinton, where we recommend you spend your third night on Route 66. Clinton does not have any classic Route 66 locations that are a must-stay, but there are a good range of motels and hotels to choose from. La Quinta Inn & Suites Clinton Historic Route 66 – This is a well-rated 3-star chain property. Breakfast included. Holiday Inn Express & Suites – Another well-reviewed 3-star property. Super 8 Motel – This is a well-rated budget option. Trade Winds Motel – Whilst this is the most authentic Route 66 option, with celebrities like Elvis Presley said to have stayed here on several occasions, reviews are mixed, so you might want to inspect the room before staying. Today you’re going to drive into New Mexico, your fifth state on Route 66, and you’ll be overnighting in the town with some of the most famous Route 66 motels that are still in operation. First though, we suggest you start be exploring what Clinton has to offer, in case you didn’t have a chance on your previous day. Clinton is home to the Clinton Route 66 Museum as well as the Mohawk Lodge Indian Store. In operation since the 1940’s, this store is a good option if you’re looking for Native American goods and history. Now it’s time to hit the road, and continue blazing your trail west. Your first stop today is going to be at Elk City, home to the National Route 66 Museum Complex. This is an excellent Route 66 museum, and one we can highly recommend visiting. 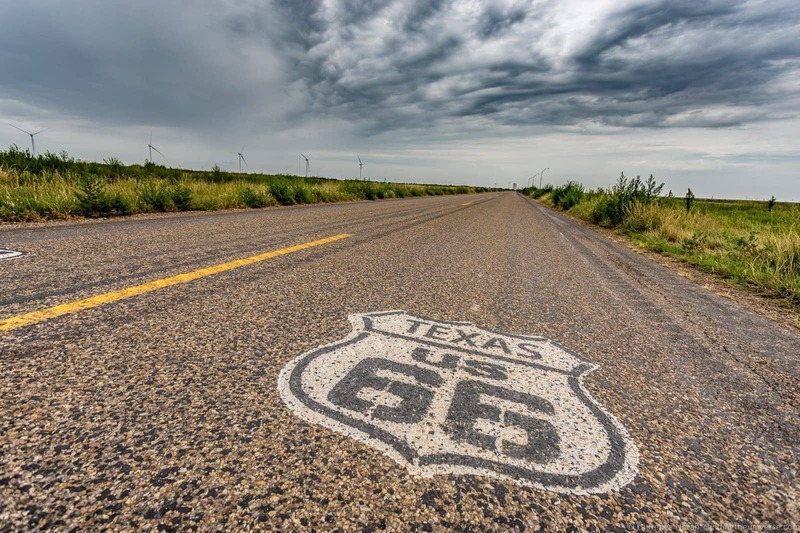 Now, as you continue west, it’s time to leave Oklahoma behind and enter your fifth state of Route 66 – Texas! As you drive west, you’re going to notice that the landscape starts to change. Towns are going to feel further apart, and the greenery of the eastern states will be replaced by more arid, desert-like landscapes. This section of the route from Texas through to the edge of California is one of my favourite parts of the drive, with those big wide open skies that make for a fantastic road trip experience. There are a number of stops along this stretch of the route that are worth stopping at. The town of Shamrock is home to a lump of the actual Blarney Stone (the rest of the stone can be found at Blarney Castle in Ireland). It’s said that if you kiss the stone you will be given the “gift of the gab”, or in other words, the ability to smooth talk your way through any situation. Shamrock is also home to the Pioneer West Museum, and a restored Magnolia Gas Station, which are within a block of the Blarney Stone. From Shamrock, you’ll want to head to the town of McLean, which is home to the Texas Route 66 Museum and Devil’s Rope Museum. This is one of my favourite quirky museums on Route 66, and it’s dedicated to “Devil’s Rope” – more commonly known as barbed wire. As the name suggests, there’s also a section of the museum dedicated to Route 66 and other local history artifacts. From McLean, continue heading west until you get to the city of Amarillo. This has a number of historic buildings along the Route 66-Sixth street historic district, and is also well known for two other attractions. The first of these is an art installation called Cadillac Ranch. This dates from 1974, so is a post-Route 66 attraction, but the colourful upended cadillacs buried in the dirt here make for a fun photo opportunity. The other must-see attraction is the Big Texan Steak Ranch. By this point in your drive, you’ll likely be familiar with the Big Texan Steak Ranch, as there are advertising billboards promising you a free 72oz steak stretching for hundreds of miles along the Route in both directions. Of course, there is some fine print – you have to eat the entire steak meal in under an hour to get it for free! We didn’t tackle the challenge, but we have eaten at the Big Texan twice, and we think it’s an experience everyone needs to have. It also has a great history, and was originally located on Route 66, although it was moved to a more prime location off I-40 in the 1970s. After Amarillo, continue along the I-40 until you get to Vega, where we recommend a short stop to visit Dot’s Mini Museum. Again, this is one of those quirky Route 66 attractions which is a bit odd, but worth a short stop. It’s essentially one person’s collection of random things throughout the years. It’s free to visit, but donations are appreciated and be respectful as this is on someone’s private property. Rejoin the I-40 for a short journey until you get to the town of Adrian. Adrian is famous with Route 66 travellers as it is the self-proclaimed midpoint of the Route. You’re half way there! Ok, so Route 66 changed its exact route many times over the years, meaning it’s quite tricky to pin down an exact midpoint, as this would have changed over the years. Still, it is definitely thought to be in the region between Vega and Adrian, and there’s a nice sign in Adrian at the Midpoint Cafe, so this works for us. It’s a great photo opportunity, and you can also grab food or pick up souvenirs here. From Adrian, you’re going to carry on the I-40, leave Texas, and enter your sixth Route 66 state of your road trip – New Mexico! Our last stop for the day is Tucumcari. In the heyday of Route 66, Tucumcari was one of the most popular towns to overnight in, and today it is home to more surviving Route 66 era motels than anywhere else on the Route. There are also some great eating options in Tucumcari, including Kix on 66 (great for breakfasts and diner food in general), Watson’s BBQ, Del’s Restaurant (a Route 66 classic since 1956) and La Cita, which serves Mexican food. 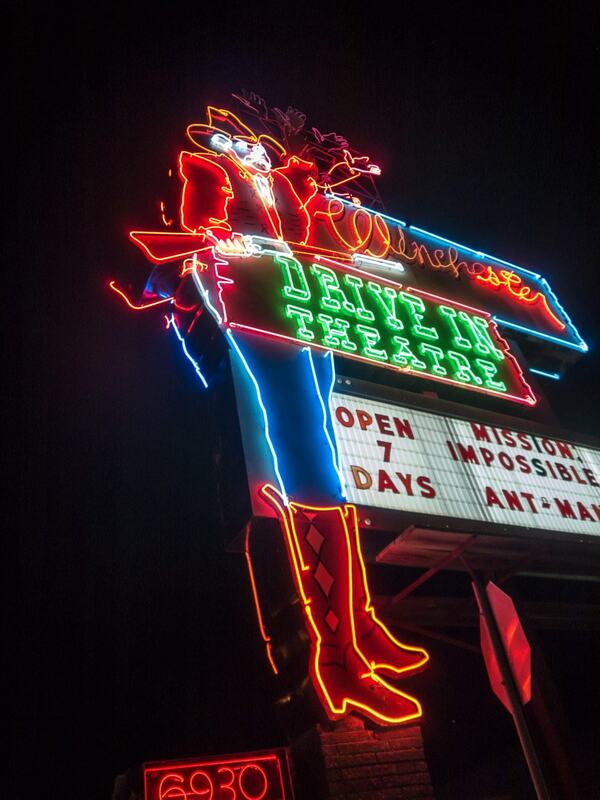 Other highlights of your time in Tucumcari will include the plethora of neon signs that light up the streets at night (it’s worth taking a walk or drive down the main street to see them all). We can also advise making time to visit Tee-Pee curios, a souvenir shop found inside a giant concrete Tee Pee, as well as the local Route 66 Museum. We really recommend booking in advance to make sure you get the motel you want in Tucumcari. Whilst you should be able to find a room (there are over 1,000 rooms in the town), the more popular motels do tend to sell out quite far in advance. If you have a particular property you want to stay in, you should definitely book it. 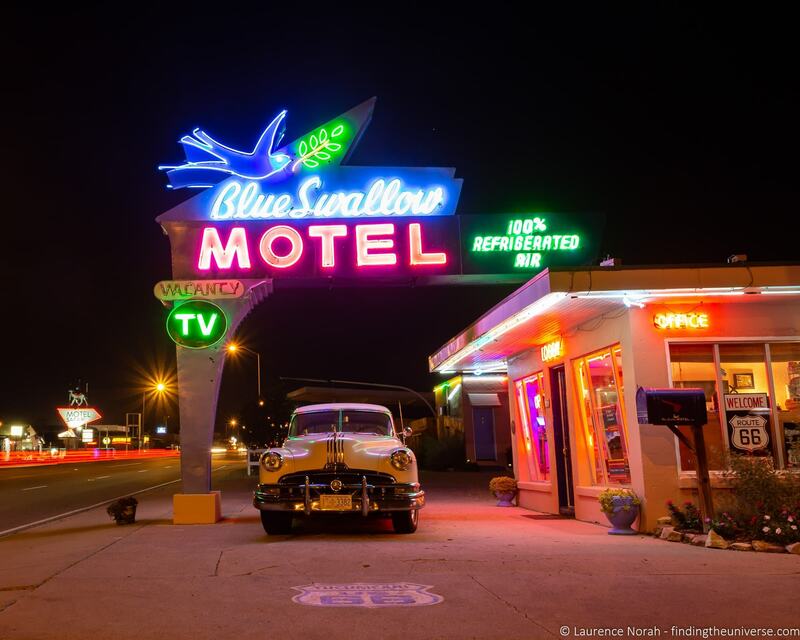 Blue Swallow Motel – Opened in 1939 this family-owned motel is one of the most iconic motels on Route 66. We stayed here on our second visit to Tucumcari and absolutely loved the vintage 1940’s/1950’s themed rooms, and the gorgeous neon sign. Note that this sells out well in advance, so definitely book early. Historic Route 66 Motel – This was the first motel we stayed at in Tucumcari. It’s a recently updated 1963 Route 66 motor court motel which offers aviation themed decor. There’s also a coffee shop on site. 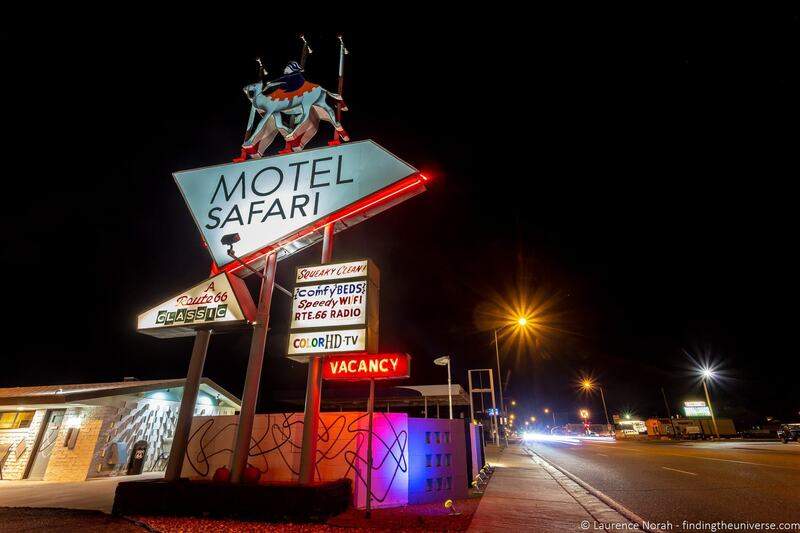 Motel Safari – This is another Route 66 era motor court, and even if you don’t stay here, you should come take a look at their classic neon sign in the evening. This one dates from 1959 and offers retro decor with modern furnishings. Desert Inn – This is a more modern and well-reviewed 3 star motel which includes features like a hot tub, a fitness center, and free continental breakfast. Today you’re going to drive right across the rest of the state of New Mexico, which has fantastic landscapes and miles and miles of beautiful open road to enjoy. You’re going to see a lot today, including the only place where Route 66 crosses itself! 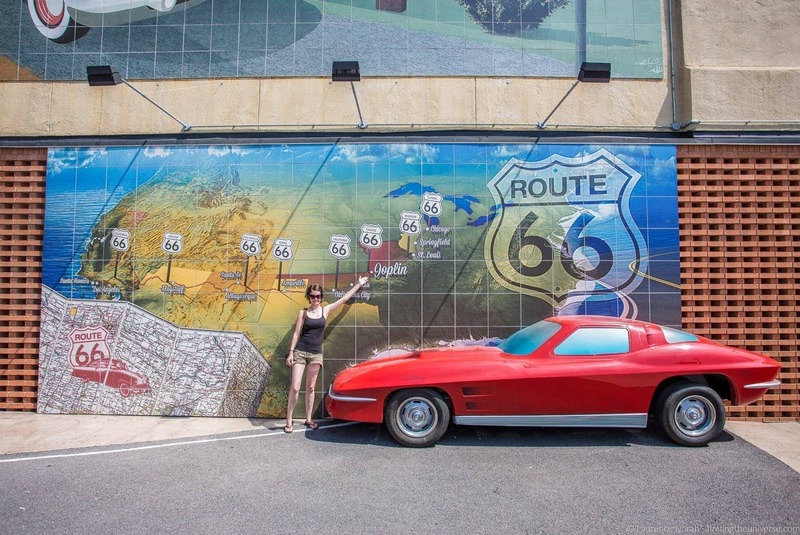 Let’s get started with Day 5 of our Route 66 itinerary. Once you’ve finished exploring everything you want to see in Tucumcari, continue heading west. 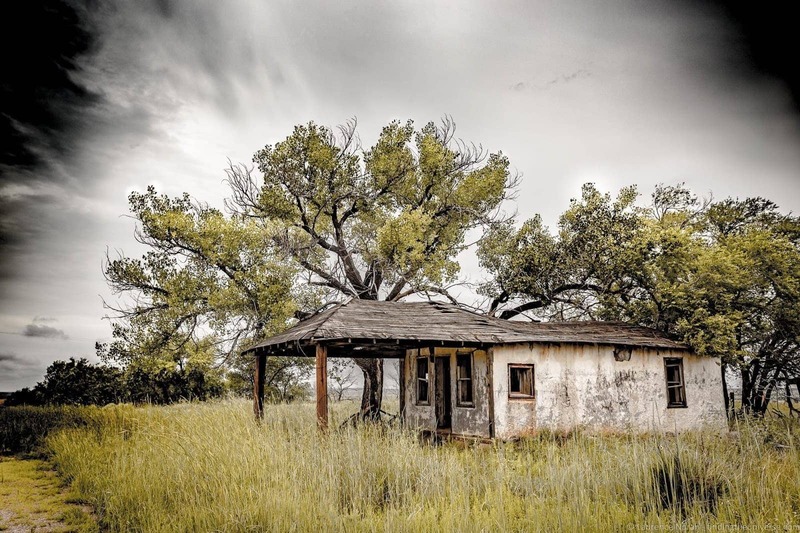 From Tucumcari to Santa Rosa, you will primarily pass a number of what are now largely ghost towns, many of which have abandoned Route 66 era buildings. We suggest however that you press on until Santa Rosa, where you will find the Route 66 Auto Museum. From here, continue on towards Albuquerque. We can recommend a stop at the Flying C Ranch. This is a large rest stop with a variety of services, owned by the Bowlin family who have been providing services to travellers in this region for over 100 years. A similar resting point can be found in Clines Corners, where Roy Cline opened a rest stop in 1937 to serve Route 66 travellers. After this, you’re going to find yourself arriving into Albuquerque, New Mexico’s largest city. This is home to the annual Albuquerque Balloon Fiesta, and there are also many Route 66 sights to be found here. These include murals, diners, shops and signs. In fact, there are so many Route 66 attractions in Albuquerque that we wrote a whole guide to Route 66 in Albuquerque. 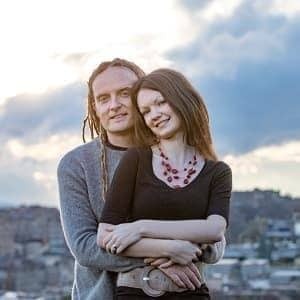 We’ve visited this city a number of times, and Jess used to live here, so we’ve also put together a guide to things to do in Albuquerque and where to eat in Albuquerque. Back to Route 66. Albuquerque was the location of a number of Route 66 alignments, and in fact, two of these alignments actually cross each other in the city. So you can stand at the crossroads of Route 66 and Route 66! This is found at the intersection of 4th Street and Central Avenue in downtown. If you are hungry at this point, there are some great Route 66 themed and Route 66 era dining options. Some of our favourites include Lindy’s (dating from 1929), the Dog House drive-in (a long time Route 66 favourite) and the 66 Diner. The latter only dates from 1987, but is found in a former 1940’s gas station and is fully Route 66 themed! Continuing on from Albuquerque, we can recommend a stop at Rio Puerco, where you can see and walk across a 1933 bridge which would have been part of Route 66. 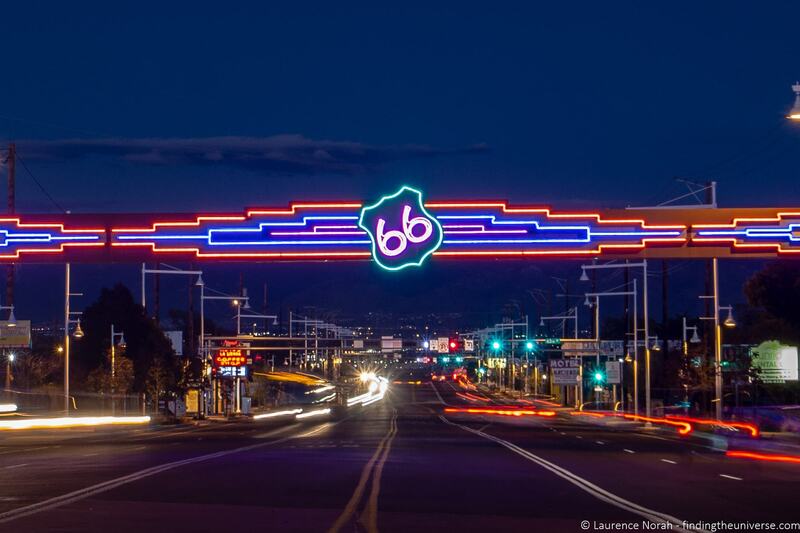 Just near here is the Route 66 Casino, which is a themed casino you might enjoy stopping at if you’re feeling lucky! From here you will pass a number of towns which were popular Route 66 stops, but have since faded somewhat. 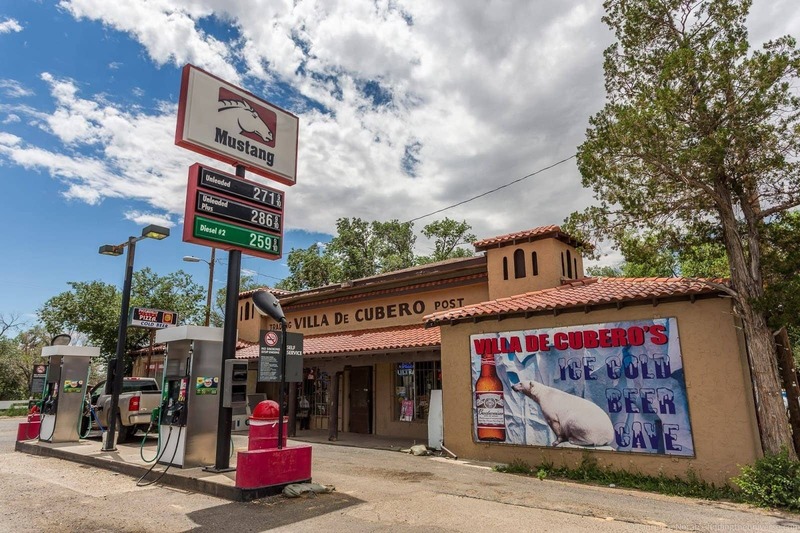 One that is definitely worth a stop is Cubero, where you might want to visit the Villa de Cubero trading post. This sells a variety of supplies, snacks and souvenirs and it’s believed that Ernest Hemingway stayed the night here. The next major town along is Grants, which is home to a number of Route 66 era motels and signs, as well as a mining museum. However, time is likely to be against you by this point, so we advise pressing on towards the Continental Divide. The Continental Divide marks the point where water drains into either the Pacific or Atlantic Oceans. Once you cross the continental divide going west, you are on the side where rainwater will run into the Pacific ocean. It’s a fun location for a photo opportunity, and there are some signs explaining the geography as well. Finally, the last stretch of driving will bring you to the town of Gallup, close to the border of Arizona, and where we suggest you spend your fifth night on Route 66. There’s a variety of accommodation options in Gallup. 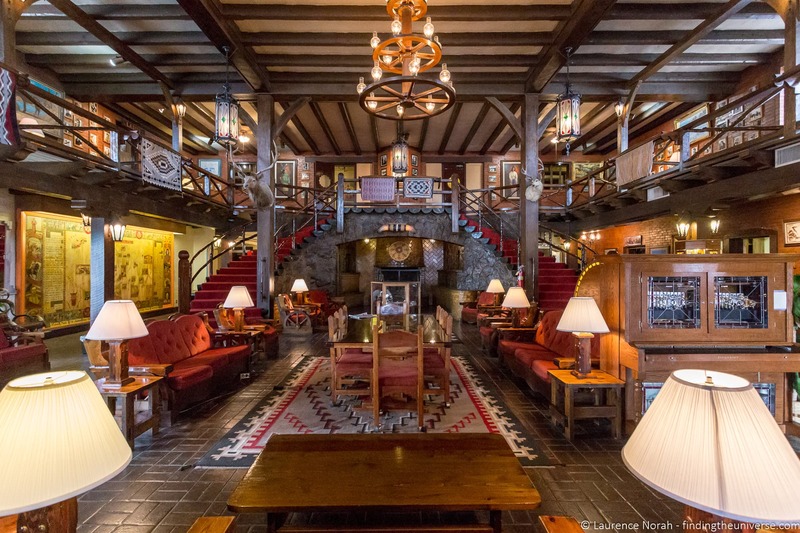 El Rancho Hotel & Motel – Dating back to 1937, this is a Route 66 landmark which has played host to numerous celebrities. This would be our pick for authentic Route 66 accommodation in Gallup. Hilton Garden Inn Gallup – A good mid-range option in Gallup. There’s a restaurant on site, an indoor pool and a fitness centre. Holiday Inn Express & Suites East – This is a well-reviewed hotel that includes breakfast. There’s also a pool. Econo Lodge Gallup – At the budget end of the scale, this is a well-rated motel with all the basic amenities you should need. 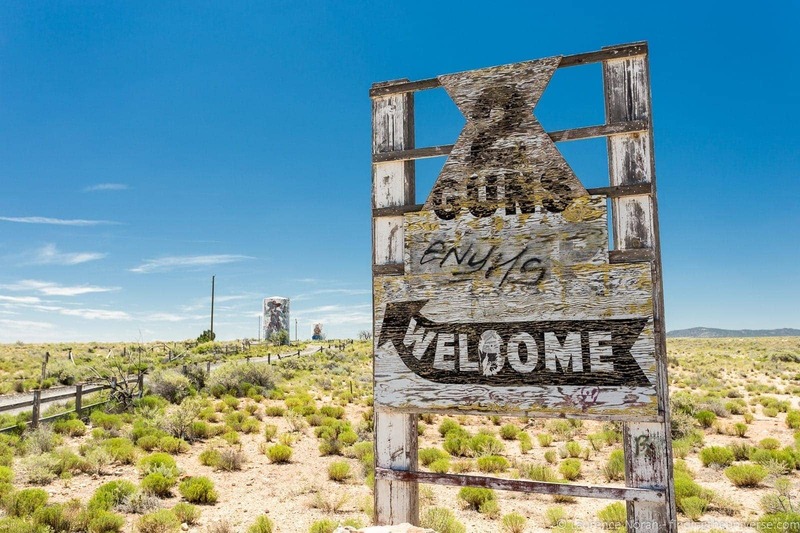 Today you’re going to be entering your seventh state on the Route, as well as having the opportunity to drive the longest surviving stretch of Route 66. Arizona is very much associated with Route 66, and there’s a lot to see in the state relating to the mother road. In fact, if you were only to drive one stretch of Route 66, we’d suggest Arizona would be the state to visit. 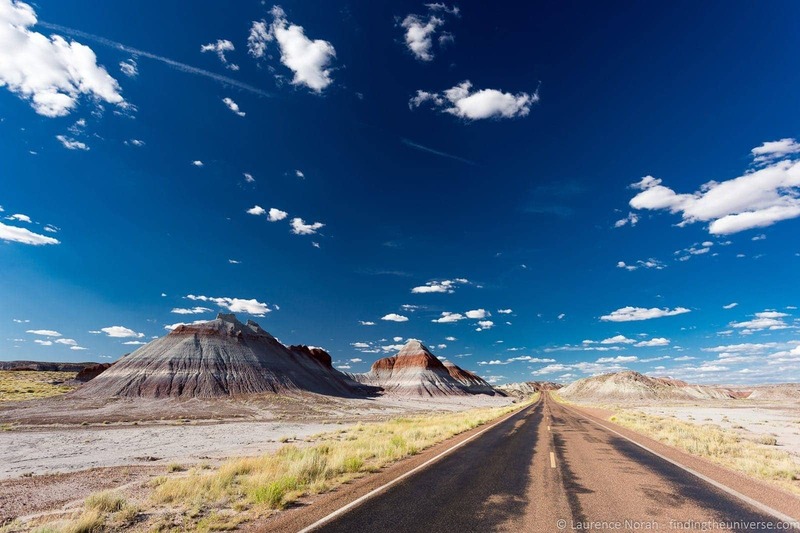 The first stop on your adventure in Arizona will be the Petrified Forest National Park, where you can also see the Painted Desert. The Petrified Forest is home to a large number of fossilised trees, and the colourful landscapes of the painted desert make it a worthy detour for photos. The Petrified Forest was a popular stop for Route 66 drivers, and an original section of the Route used to run through the park. Whilst this no longer exists, there is a rusting old car here that makes for a nice photo opportunity. There are of course hiking trails and other wilderness activities available here, but given your limited time, we suggest you just drive through the park, pick a couple highlights from the visitor map, and then head on into Holbrook. Holbrook has a number of fun and quirky Route 66 attractions. If you’re looking for souvenirs, you might consider either the Rainbow Rock Stop or Stewart’s Petrified Wood Shop. These two locations are also home to various giant statues. You may also want to drive by Holbrook’s famous Wigwam Motel. Here you’ll find large concrete teepee’s that have been operating as a motel since 1950. From Holbrook, you will continue west until you come to two of the Route’s more famous trading posts. The first of these is the Geronimo Trading Post, which is home to what is claimed to be the world’s largest petrified log. It is certainly very big! 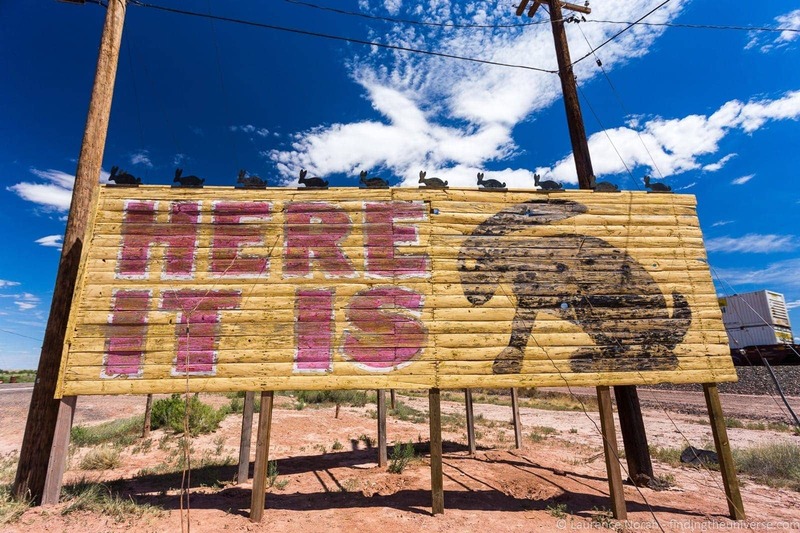 The next stop is one of the most iconic signs on Route 66 – the “Here it is!” sign at the Jack Rabbit Trading Post. This was well known in the Route 66 era as there were many signs along the highway in both directions promising a wonderful experience to anyone who stopped by. Many of these signs still exist along the route. We definitely recommend stopping here for a photo of the sign, and dropping in to buy something to support the trading post as well. Your next stop is going to be the town of Winslow. This was made famous by the Eagles, whose 1972 song “Take it Easy” features the lyrics “I’m a standin’ on a corner in Winslow, Arizona”. The town has very much embraced this song, and there are multiple references to it throughout the town. The most obvious of these is at the corner (of course!) of Kinsley & Second Streets, where you’ll find a mural depicting events in the song, as well as a statue and sign. There’s a lot more to see in Winslow from Route 66, including old gas stations, signs, motels, and cafes. If you are hungry, we can recommend a stop at the 1955 Route 66 era roadside diner, the Falcon Restaurant & Lounge, at 1113 E. 3rd Street. After Winslow you will pass the remains of two former Route 66 attractions, Twin Arrows and Two Guns. These were famous stops for travellers on the Route, but they have long been abandoned and left to decay with no much left today. You will then come to Flagstaff, the largest city on the Route today. This was home to multiple variants of the Route 66 route, and there are numerous reminders of Route 66 throughout the city. We would suggest a visit to the historic 19th century downtown area would be a good option in Flagstaff. Food wise, there are a number of Route 66 era dining options, including Miz Zip’s, the Grand Canyon Cafe, and Galaxy Diner. From Flagstaff, you will head on to Williams. If you are planning a detour to the Grand Canyon (we suggest adding a day or two to your itinerary if so), Williams is where you will do this, as the south entrance to the park is only about a 70 minute drive from Williams. Williams was the last town on Route 66 to be bypassed by the Interstate, and there are a number of Route 66 era businesses still in operation that you can visit. The Route 66 Gas Station Museum is also well worth a visit. After Williams, you will pass Ash Fork, home to the Ash Fork Route 66 Museum, which you can stop at if you have time. Just after Ash Fork you will find exit 139 of the I-40, which leads you onto the longest surviving stretch of Route 66. This is 159 miles long, and is very much worth the drive – it’s one of our favourite stretches of the whole route. Finally, the sixth day of your Route 66 itinerary will have you arriving into the town of Seligman, where we suggest you spend the night. Seligman has many historical buildings, and has fully embraced Route 66, with lots of shops, cafes, and quirky stores to visit. For food, there are a number of good options. If you arrive late, the Black Cat Bar is likely your best option for late night snacks, as it is one of the few places open after 9pm. Another great Route 66 option is Delgadillo’s Snow Cap which opened in 1953. Seligman has some fantastic authentic Route 66 era motels to choose from. Here are our picks for your stay. Deluxe Inn – Found next door to the popular Roadkill Cafe, this is a well-rated and good-value motor court motel which dates from the 1930’s. Stagecoach 66 Motel – Featuring themed rooms, this 1960’s era motel (originally called the Bill Mar Den Motel) offers basic accommodation for a good price. Supai Motel – Dating from 1952, this is a well-reviewed vintage Route 66 era motel. Continental breakfast is included. Historic Route 66 Motel – Another vintage motel with themed rooms found next to the Roadkill Cafe. This 1950’s doesn’t take online reservation – Call +1 928-422-3204 for a room. 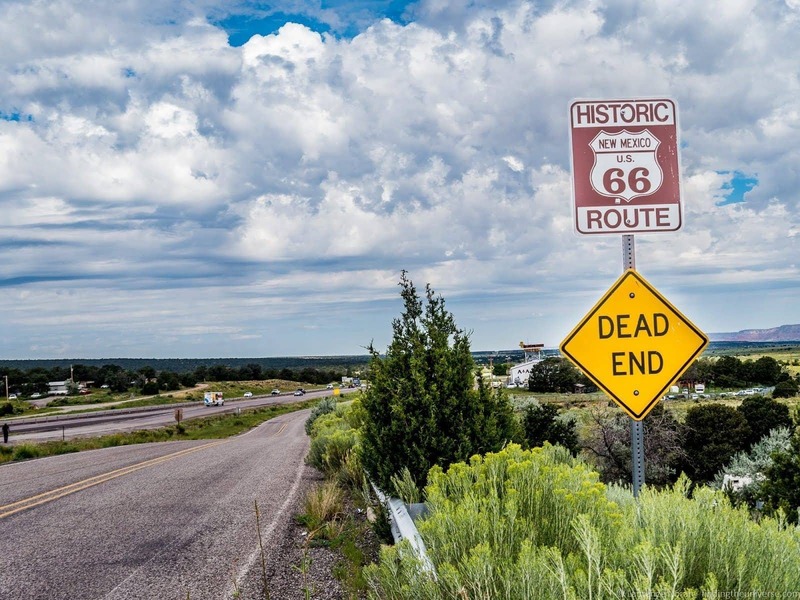 Your last full day on Route 66 has you entering the final state of your road trip, and almost completing the route. If you are pressed for time, you could actually drive the remainder of the route today, but we think there’s a lot to see today, so finishing on the eighth day is a better option. 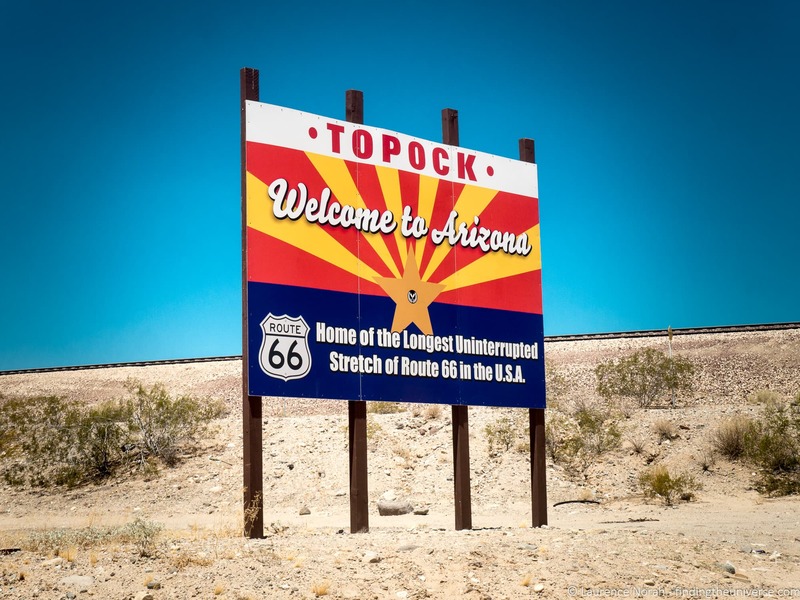 From Seligman, we suggest continuing along on the longest stretch of Route 66, which you will follow all the way to Topock, near Needles. Whilst this will be slower than the Interstate, this is by far one of the best preserved and most impressive stretches of old Route 66 you can drive today, and we think it is worth taking a bit of time to enjoy it. There are a number of highlights along the way which are worth a stop. First of these is the town of Truxton, where there are a number of Route 66 buildings, as well as what was once the Frontier Motel and restaurant. The next stop is the city of Kingman, home to the Arizona Route 66 Museum. There are also other buildings and Route 66 signs. We can also recommend Mr D’z Route 66 Diner in Kingman if you need a refreshment stop. This dates from 1938. The next section of Route 66 is particularly scenic, with the road winding over the hills. Sitgreaves Pass is a good spot for a photo opportunity (there’s a pull out at the top of the pass), and you can reflect as to how tricky this winding stretch of the route must have been for drivers in times gone by. Oatman is the next stop on your itinerary. This former gold mining town is famous for it’s daily wild west shows, as well as the live burros which wander the streets. 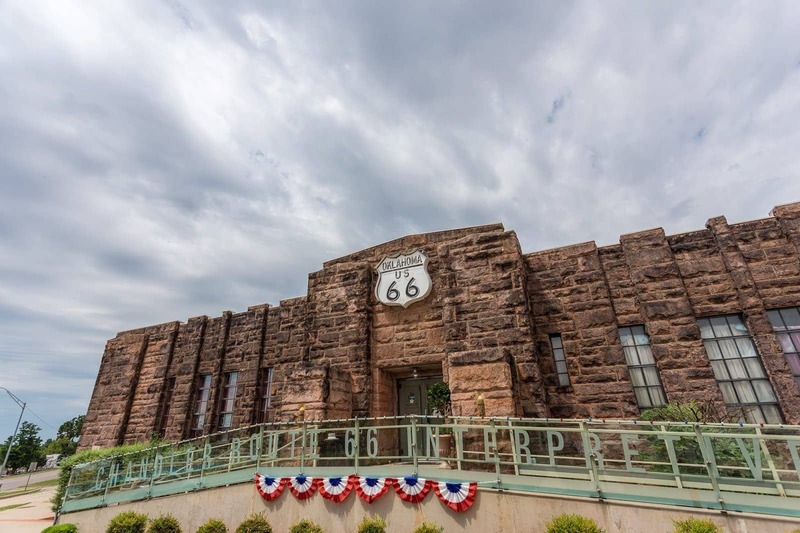 Whilst these attractions didn’t exist during the Route 66 times, they certainly are in keeping with the sort of thing Route 66 travellers would have expected to see along the Route, and it’s worth stopping off to explore for a little while here. From Oatman you will continue on to Topock, the last town in Arizona. Here you’ll cross the Colorado River and enter California! The first city you’ll come to in California is Needles. This is famous as being one of the hottest places in the USA, and when we visited it was 110 degrees F. Needles has some nice murals as well as a number of vintage motels and signs. 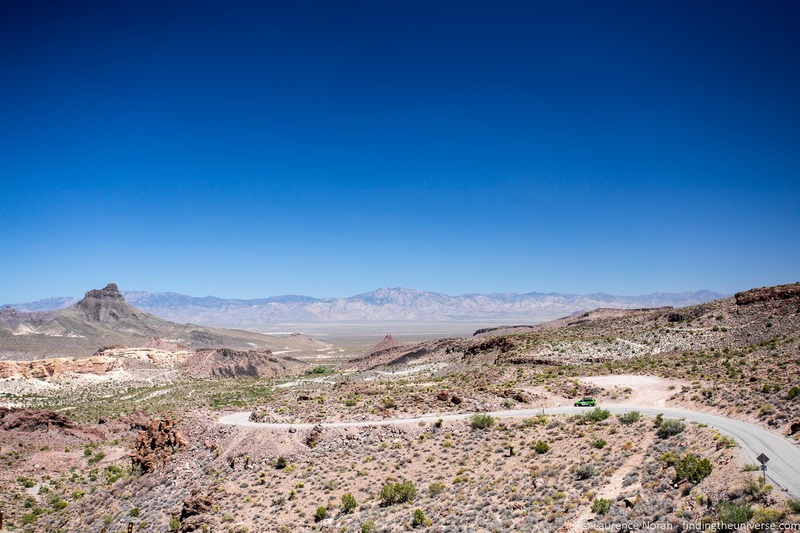 From Needles, you’re going to be driving through the incredible landscape of the Mojave Desert. Travelling today in our vehicles with air conditioning and comfortable suspension, it is hard to imagine how difficult this part of the Route must have been in cars that were often well past their prime, and which had already made a valiant effort to get this far. 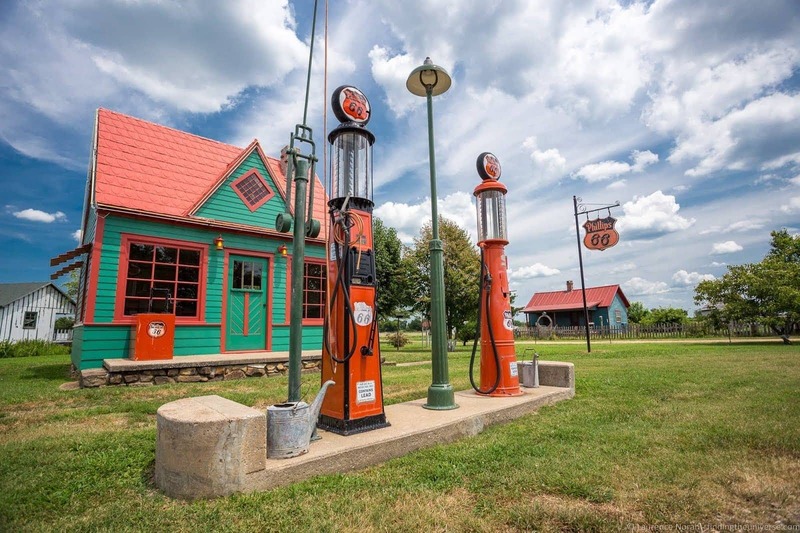 If you have the time, you will definitely want to detour off the I-40 at Exit 115 to follow the original Route 66 through some of the old towns that have long been forgotten by the majority of passing motorists. These include Chambles, Amboy, and Bagdad. Amboy is home to Roy’s Motel and Cafe. This was an iconic Route 66 stopping point where there’s a giant and often photographed sign. The location dates from 1938, and today there is a gas station, a gift shop and some cold snacks and coffee. The motel is no longer operational. There’s nothing really left of Bagdad any more, although there was once a popular cafe here known as the Bagdad Cafe. The next town along, Ludlow, has a cafe, gas station and motel. Back on the I-40 and you’ll pass Newberry Springs which also has a number of attractions, including the location of the new Bagdad Cafe. This is a popular stopping point as it’s the filming location for a 1987 German film called Bagdad Cafe. The next major stopping point is the city of Barstow. This is the home of the Route 66 Mother Road Museum. There are also a number of vintage motels, Route 66 era signs and businesses. From San Bernadino you will pass through a number of towns that have surviving Route 66 businesses, although you will likely be running out of time by this point. We’d suggest, if you have time, that a stop at the California Route 66 Museum in Victorville would be worth it. Finally, your seventh day of Route 66 adventure will bring you to San Bernardino, where you will spend the final night of your grand USA road trip. This is a city in its own right which marks the beginning of the Greater LA region. It’s also famous as being the location of the world’s first McDonald’s restaurant, which is now a museum. 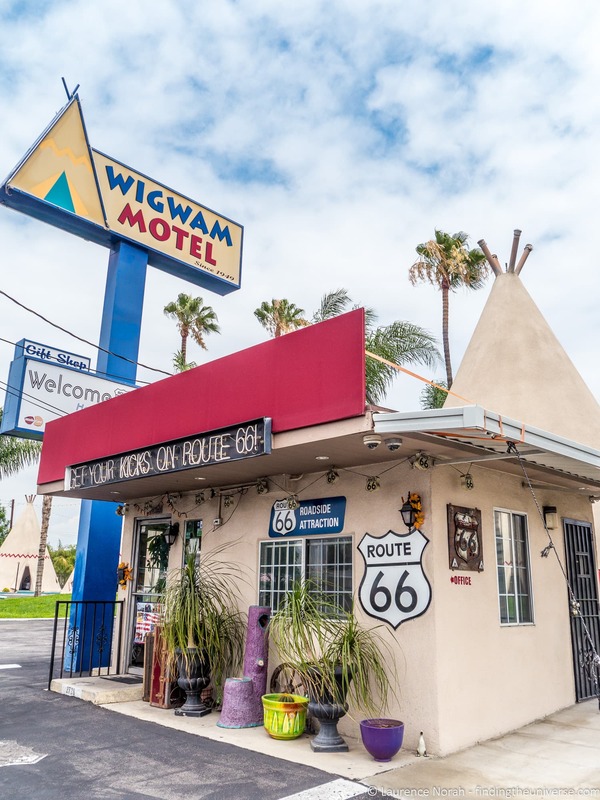 Wigwam Motel – Dating from 1949, this is one of the two Wigwam Motels that are still available on Route 66. The TeePees here are also concrete, but they come with private bathrooms and are comfortable if basic. Homewood Suites – This is a good mid-range option that features comfortable rooms, many of which have kitchens and sitting areas. Breakfast is included, and there’s an outdoor swimming pool. Hampton Inn & Suites – This is a chain hotel with favourable reviews. Rooms are comfortable, and some have refrigerators and microwaves. Breakfast is included and there’s also a pool. Econo Lodge – If you’re looking for a budget option, this is a well-reviewed if basic motel. It’s your last day of your Route 66 adventure! To be honest, this will be quite a short day, as the idea is that you will be able to return your vehicle if you have hired one, and catch a flight home. Or take time to explore Los Angeles or continue your road trip adventure – maybe along the Pacific Coast Highway? The main highlight of today is reaching the end of the road. Much like the beginning of Route 66, we have to admit that this is somewhat underwhelming. The original end of Route 66 was at 7th and Broadway in downtown LA. This was then moved to the intersection of Lincoln and Olympic boulevards in Santa Monica. As neither of these locations has anything exactly going for it that marks the end of such an epic adventure, the Route 66 Alliance decided that a more fitting end to the Route would be Santa Monica pier, where you basically can’t drive any further. As such, there’s an “End of the Trail” sign on Santa Monica pier, and this is where we suggest you drive to complete the route. The sign also has a gift shop, and you can stop off here for a photo and to buy souvenirs. The nearby beach is also lovely, and you’ll find the grave stone for Will Rogers nearby. You made it! To help you visualise the route, we’ve put all the major highlights mentioned above from road trip itinerary into a map, which you can also see on Google Maps here. We have a complete planning guide for Route 66, which we suggest you read through before tackling the Route, as it is very comprehensive. However, we also wanted to share some quick tips for your trip as part of this itinerary. Some of the sections below include tips for useful products you might need for driving the route, including guidebooks and maps. We’ve put these, plus some more recommendations, all together in one list to make it easier. You can see that by clicking here. For each day of this Route 66 itinerary we have suggested accommodation options. We definitely recommend booking in advance if you can for your trip, especially if there are specific properties you want to stay at. Whilst there are generally plenty of options, the more iconic motels can book out far in advance, especially in the busier summer months. We’ve also provided links to how to book each hotel. While many of this properties are on booking sites like Booking.com, the smaller motels may not be, so you might have to either contact them directly by phone or e-mail. Don’t forget to also check out other booking sites, including AirBnB, as well as some of our favourite alternatives to AirBnB. 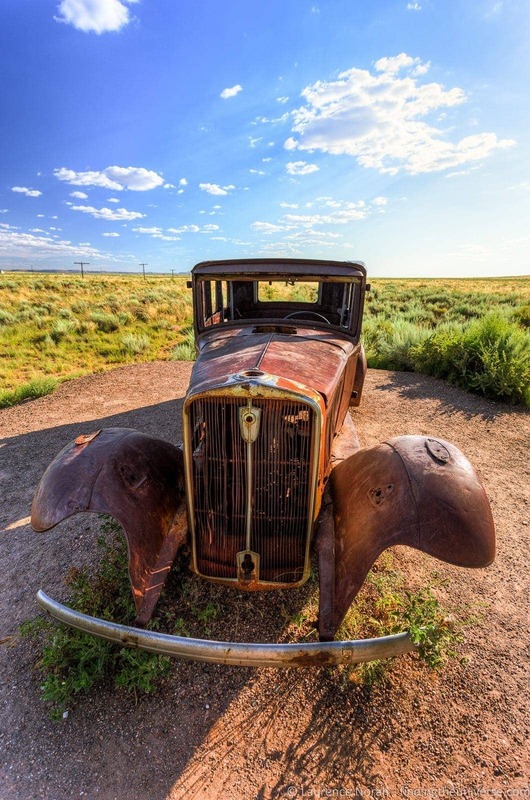 Route 66 is a road trip, so naturally you are going to need a car if you plan to drive! If you are from the USA, you might already have your own car of course. Just bear in mind that this is a one way road trip, and so you will have to drive back to wherever you have originally started from. If you’d prefer not to do that, or are travelling from outside the USA, then you have a number of options for renting a car for Route 66. First of all, you can rent a normal car in a size to suit. Just be aware that if you plan on doing a one way rental (picking the car up in one place and dropping it off somewhere else), car rental companies will charge an additional fee. For one way rentals in the USA, we often find Enterprise to be the best value. You can check prices with them here. Of course, there are lots of other options. If you want to compare prices on car rentals across a range of providers, then we use and recommend Priceline. Just be aware that when comparing prices using a comparison service, they sometimes forget to add the one-way fee. Naturally, we appreciate that as Route 66 is an iconic USA road trip, you may want to drive it in an iconic vehicle such as a Chevrolet Corvette or Ford Mustang. These will usually carry a price premium. Whilst some of the major car rental firms will have these vehicles as an option, you may also want to look at car rental companies that specialize in classic car rentals such as Ride Free. If you want to ride a motorbike, this is also an option for Route 66 of course! We’d advise looking at specialist Route 66 rental companies like Eagle Rider and Ride Free. Finally, Route 66 can also be done in an RV, also known as a campervan. Again, you will want to hire from a firm that allows for one way rentals, and which has offices in both Chicago and LA. Some options to consider include USA Rentals and Cruise America. Car rental in the USA is similar to rental in other countries. Most rental firms will require you to be at least 21 years of age, and there is often an additional fee if the driver is under 25. You will likely need a driving license printed in Latin characters, ideally English, however different rental companies will have different conditions. If this is your first time driving in the USA, we highly recommend taking some time to read our guide to driving in the USA, which has lots of tips to help you plan. If you love the idea of Route 66, but don’t love the idea of planning everything, you might consider a tour instead. 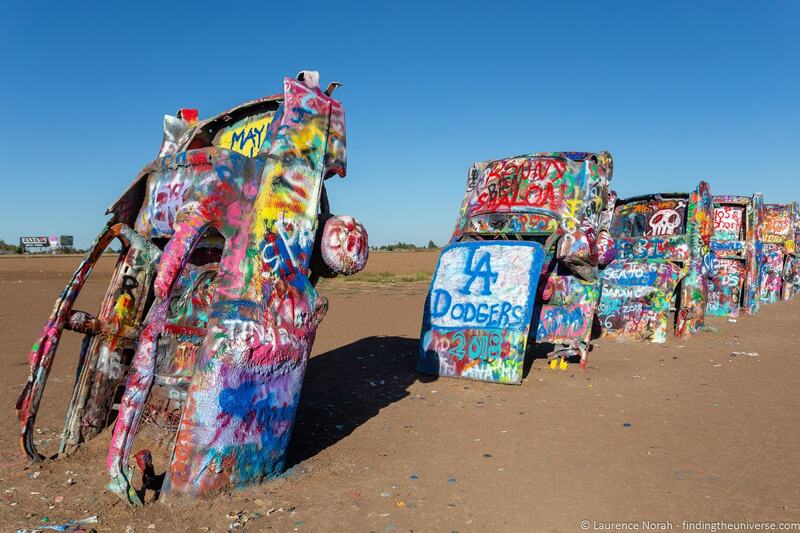 For example, this 13 day tour includes a local guide for the duration of the trip and you travel with a group of other drivers driving along Route 66 – although you do have to bring a vehicle along and drive it. The most accurate guided tour we have found to date is this Route 66 tour, although it does take 2 weeks to complete the route. 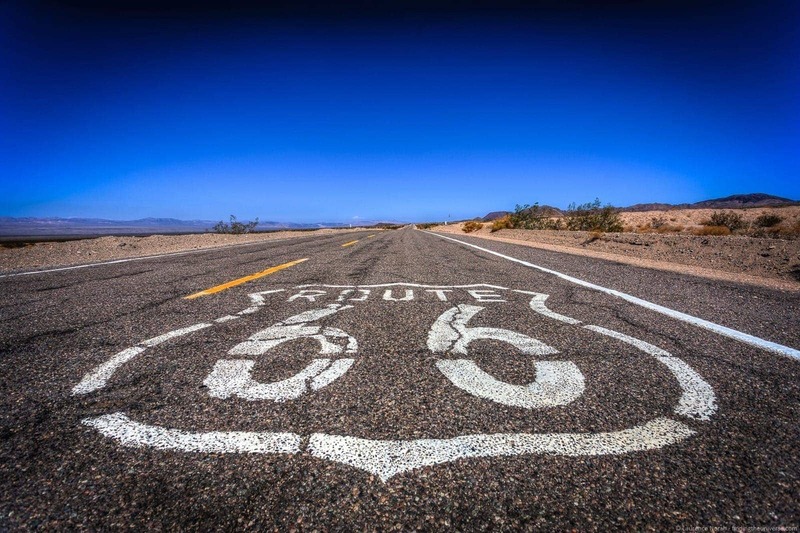 Finally, those of you coming from the UK and Europe will appreciate this 17 day Route 66 tour. We didn’t have any problems travelling Route 66, however you should always be vigilant when travelling and practice basic safety precautions like keeping your valuables out of sight. The larger cities in the USA certainly have their crime problems, as with anywhere in the world, whilst you will find that smaller towns tend to have low crime rates. Route 66 is a bit of a strange one, because it doesn’t exist any more as a single road. So whilst some sections of the route do have markers and signs, you can’t follow these reliably and expect to get from Chicago to Los Angeles! Our suggestion for our itinerary is to take each day as it comes, to pick the attractions each day that you want to see, and to navigate between them using good navigation software like Google Maps, or a dedicated GPS unit. Also recommend having a good USA Atlas like this in the car. If you want to really follow the Route faithfully, at least in part, then we highly recommend picking up a copy of the EZ66 Guide for Travelers. This is the best Route 66 book available as a navigation aid, and is one we strongly recommend for all Route 66 adventurers! Being in the USA, the currency along Route 66 is obviously the US dollar. The majority of shops and businesses along the route accepted credit cards in our experience, however there is a small minority where cash is preferred or are cash only, so we recommend travelling with some USD cash as well. There are ATM’s along the route in the major towns and cities, but not always in the smaller towns, so we suggest getting some dollar bills before you start. The USA uses a 120 Volt electrical system. If you’re coming from abroad you need to check if your equipment supports this standard. In our experience, most laptops and phone chargers will work (the adapter will have 100 – 240V marked on it), however high powered items like hair dryers, hair straighteners, and travel kettles will not. Whilst voltage convertors are available, these tend to be heavy. So our advice would be just to get a dual voltage travel version of any item you particularly need, such as this hair dryer or these hair straighteners. Alternatively, you can pick up a cheap version of whatever it is you need in the country from somewhere like Walmart. Plugs in the USA are for the most part a narrow two pin plug. If you’re coming from outside the USA where your equipment uses a different plug, you’ll need a travel adapter like this. We also advise travelling with a power strip. On Route 66 especially, the older motels don’t have many outlets. Something like this would be good. Putting together a classic Route 66 soundtrack before you go is a fun way to prepare for your trip. Naturally, you’ll want to include one of the versions of “Getting your Kicks on Route 66“, we suggest the version by Asleep at the Wheel is a good option. We also think “Take it Easy” by the Eagles should make it onto your list! Most rentals these days support either Bluetooth or USB connectivity, so you could load a playlist onto your device or a USB stick before you go, so you’re fully prepared! There are a number of books and maps which have been published to help you plan your Route 66 trip, many of which we bought prior to our adventure. From these, we recommend the following as the most useful for your trip. EZ66 Guide for Travelers by Jerry McClanahan – This is a turn by turn guide to the route and attraction highlights of Route 66. 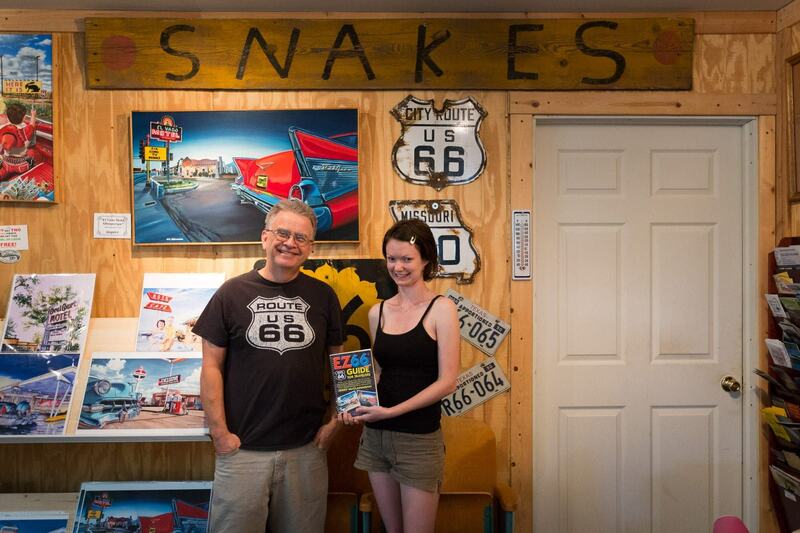 If you only buy one book for your Route 66 trip, you have to make it this one. We used this throughout our whole trip, and it was invaluable. 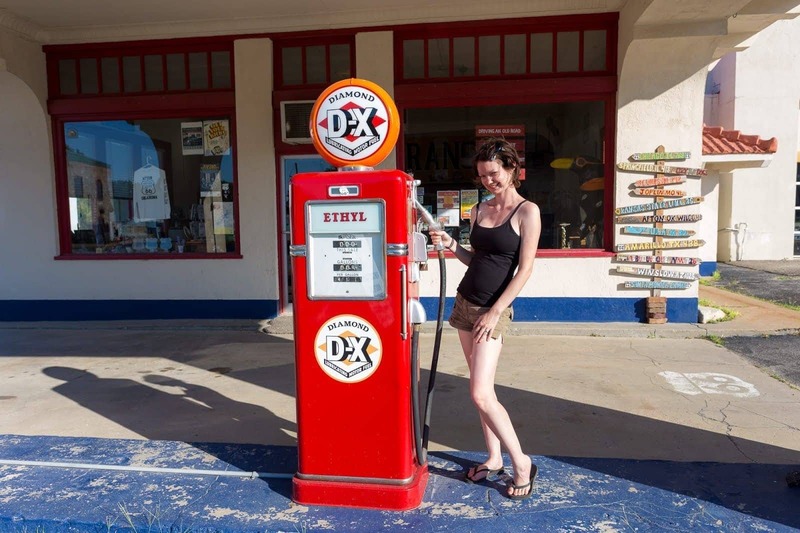 Route 66 Adventure Handbook by Drew Knowles – Whilst not turn by turn, this is still an excellent guide to the Route, and it also provides a good overview of the majority of the roadside attractions along Route 66. It also has some motel and dining options. Here It Is! The Route 66 Map Series – This set of 8 hand-drawn maps (one for each state) provides both eastbound and westbound directions driving directions. In addition, the most popular attractions are listed on the map. To be honest, we found the EZ66 guide easier to follow, but we do like the maps as a memento of our adventure. Well, we’re at the end of our Route 66 USA Road Trip itinerary! We hope you found this guide useful. Before you head onto the Route, we wanted to share some more resources that you might find useful when planning this trip. As well as this one week itinerary, we also have a detailed and comprehensive two week Route 66 itinerary. We suggest reading that too, even for a shorter trip as it has even more lodging, dining and attraction recommendations along the way! Route 66 is one of our favourite road trips. However, we also have guides to some other road trips in the USA, including a California road trip, a Pacific Coast Highway road trip, and a Deep South road trip. We also have lots more content on travelling in the USA, from city guides to travel tips. See our guides to Things to do in Savannah, Things to do in Charleston, Things to do in Albuquerque, Visiting New Orleans During Mardi Gras, Things to do in Cambria and Things to do in Santa Fe to get started! And that’s it! As always, if you have any feedback or questions about this post and taking a Route 66 road trip, just let us know in the comments below! Wonderful write up/itinerary. Some how I was tagged on this tweet but my place is not mentioned or even my wonderful city, Waynesville, Missouri. Please stop by if you are on the Mother Road in Missouri again. Thanks Jax! We did pass through and Waynesville is mentioned in our 2 week itinerary, but we unfortunately didn’t have time to stop and see your shop. Next time we will be sure to stop by though! 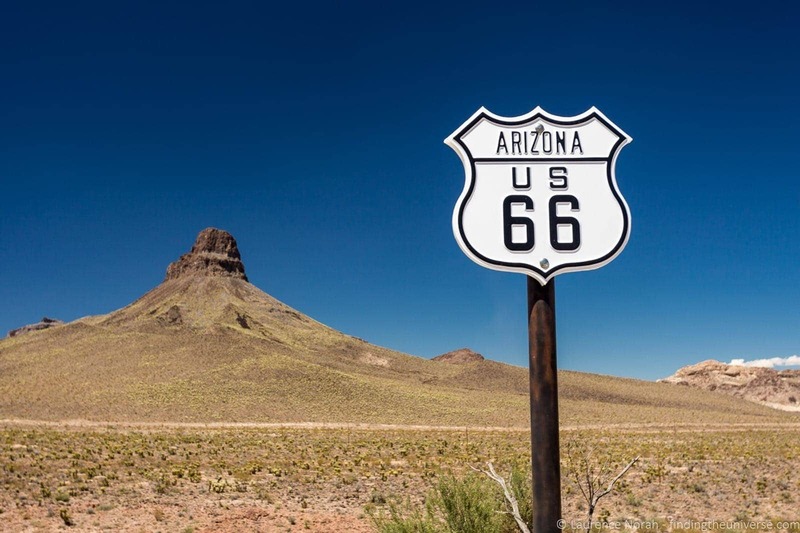 Your blog looks interesting I was looking for something or someone that was writing about Rome and Paris on a train and I saw you guys but then I saw this Route 66 thing and because I live in Arizona and love to go to Flagstaff, I looked at your route 66 articles. This is the best town to visit in Arizona. I thought I’d see what you had to say about it and gosh I think you guys really missed the mark on Flagstaff you need to come back and spend some time in Flagstaff. You have no idea what a cool town it is and how many really really good food spots there are. Thanks for your comment. We definitely would like to come back to Flagstaff to spend a bit more time to see what is on offer. Unfortunately, on a 1 week Route 66 itinerary, there isn’t a great deal of time to explore along the route in great depth. We did cover Flagstaff a bit more in our two week Route 66 itinerary, as in that post we include it as a stopover, and with two weeks there is a bit more time to see more.